"Making Stupid Mistakes is EXTREMELY Expensive!" Are you thinking about getting into real estate investing? Or perhaps, you dabbled with it for a while, you already own a few rentals and you want to expand and own more? There are two main ways to learn. You can learn the hard way by making your own mistakes or I would recommend learning from the mistakes of a another successful landlord. We are excited to make available a new book from one of the long-time regular contributors to the MrLandlord.com Q&A Forum, Dan Arnold (Dan, MA). I highly recommend his book, Stupid Mistakes of A Self Made Millionaire Landlord, for any real estate investor, so that you can learn from someone who has made a lot of mistakes (some very expensive), but still overcame those mistakes to build a lot of wealth with real estate. For those who are cynical about real estate authors, rest assured that Dan didn't make his fortune writing books, he built his income all through his real estate investments and shares his hard learned lessons for others to benefit. According to Dan, by no means did he write it to make a fortune in the publishing business; real estate is much more lucrative! Rather, he wrote it because he has years of experience investing in real estate and he thought he could help other investors work towards even greater success than what he has enjoyed, by pointing out his mistakes and how to avoid them. Dan has shared for many years on the MrLandlord.com Q&A Forum and is considered one of the most respected contributors. Dan also joins us on our annual MrLandlord.com Cruise Conference, where he exchanges a wealth of ideas and strategies with other successful rental owners. Dan has joined us 16 years in a row. If you are ever considering going on a unique Landlord Retreat, join us at the next one. Click here for complete Retreat Conference details. Dan has been an active investor for 25 years and continues to make investments to this day. "All the other real estate books tell you what to do. This one tells you what NOT to do and will prevent many costly mistakes." Thanks to what Dan has learned, with each new property he buys and manages, he makes smarter, better deals and bigger profits. 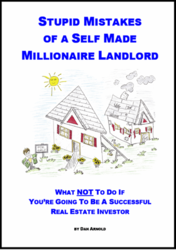 Order your copy of Dan's, Stupid Mistakes of a Self Made Millionaire Landlord" and learn from Dan's fifteen years of experience. You can order the book for $39.95. To order, click now below.